San Quirico d'Orcia, a charming village situated on a sweet hill in the beautiful countryside of the Val d'Orcia, a land of great wine and good oil, has always been an important military stronghold during the wars between Siena and Florence. Of the defensive structures remains in fact much of the 15th-Century walls, which are still visible together with 14 towers and turrets and the Porta Nuova. The medieval urban layout has remained unchanged and within the walls, we find the Church of The Collegiata with its three Romanesque portals, Palazzo Chigi, the Church of San Francesco with a Madonna by Andrea della Robbia and the small and fascinating Church of Santa Maria Assunta. Nearby it is worth visiting the ancient Bagno Vignoni, spa full of pools of water flowing from more than 1,000 meters deep, the fortified villages of Montalcino, Buonconvento, Pienza and the Abbey of Monte Oliveto. First floor apartment in panoramic Agriturismo in Val d'Orcia, equipped with all comforts: satellite-tv, Wi-Fi access, pool, bio-lake and small typical restaurant. Ground floor apartment for 4 persons in a panoramic Agriturismo in Val d'Orcia, equipped with all comforts: satellite-TV, Wi-Fi access, pool, bio-lake and small typical restaurant. 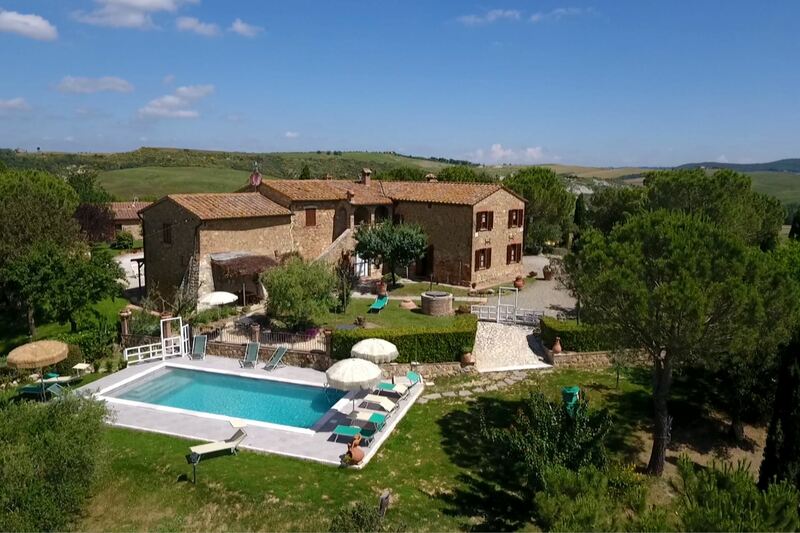 First floor apartment for 6 persons in a panoramic Agriturismo in Val d'Orcia, equipped with all comforts: satellite-TV, Wi-Fi access, pool, bio-lake and small typical restaurant. Ground floor apartment in a panoramic Agriturismo in Val d'Orcia, equipped with all comforts: satellite-tv, Wi-Fi access, swimming pool, bio-lake and small typical restaurant. Ground floor apartment in a panoramic Agriturismo in Val d'Orcia, equipped with all comforts: satellite-tv, Wi-Fi access, pool, bio-lake and small typical restaurant to taste typical Tuscan dishes.